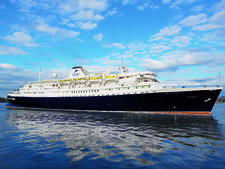 Astor joined the Cruise & Maritime Voyages' fleet in February 2013 on a three-year charter. 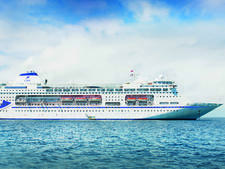 The 620-passenger ship is the sister ship to Saga Pearl II (Astor is 25m longer), and was originally launched into the British market in 1987 as a soft-adventure ship before being bought by the German river cruising conglomerate, Premicon Group as the sole ocean-going vessel in the company's fleet. The ship's most recent refurbishment was a £14 million upgrade in 2010. Astor is higher-end than CMV's other two ships -- Marco Polo and mv Discovery -- and gratuities and all dining (including the specialty restaurants) are included. 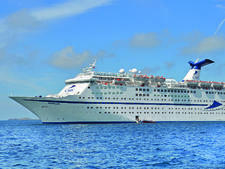 It spends its summer catering exclusively for the German market mainly on short voyages to Northern Europe; before setting sail for Australia in November, via West Africa, South Africa and Mauritius on a 38-day voyage, before sailing back in March. Like its fleetmates, Astor is based in the Port of Tilbury, some 22 miles from Central London, which by coincedence is also where the so-called "£10 Poms" set sail from after the Second World War. 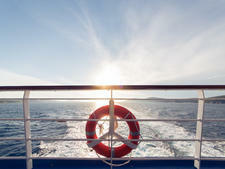 The ship has 289 cabins; 249 of them are standard; 39 are classified as suites and three as 'Premium Suites'. Three quarters of them have an ocean view with large windows (some floor to ceiling); but only three cabins have balconies (the three premium suites at the front of the ship). Standard cabins -- both inside and outside -- are all 13 square meters (139 square feet). This allows for two single beds (some insides have two bunks on the wall, which is a bit crowded), or a bed and a sofa-bed; a square desk, a small flatscreen TV fixed to the wall, a minibar, a wardrobe, a safe and a shower room with shampoo and body wash in bottles. The outside cabins have two large upright rectangular windows, which allows for a lot of light. Premium Suites are 26 square meters (279 square feet), and include a living area, a double bed, two floor-to-ceiling windows (reminiscent of a river ship), a large, L-shaped desk, plenty of wardrobe space, a shower room and a bigger collection of amenities. There are three suites at the front of the ship, just below the Bridge, which by any standards are impressive. You can see where some of the £14 million of refurbishment went. There are two Senator Suites, which are mirror images of each other, on the port and starboard side. The Astor Suite is in the centre. All three share a large balcony at the front (not accessible via the suites, but through a communal door at the front). The two Senator Suites have a large living area, a double bed and a balcony, albeit a small one (3 square meters or 32 square feet), just enough space for a table and two chairs. There is a large wardrobe and a bar area complete with a fridge and coffee machine. The marble-fitted bathroom is impressive, and includes a tub and a separate shower. There is also a TV embedded in the bathroom mirror, just in case you need to catch the end of a TV program while getting ready for dinner! The Astor Suite is 59 square meters (635 square feet), and has two separate rooms: a bedroom and a large living room, both flooded with light from the huge glass windows. The bathroom is equally impressive -- accessed via a long corridor from the living room or via a separate door into the bedroom, it is all marble, TV embedded in the mirror, tub, separate shower and toilet. The eight decks consist of seven traditional wooden decks and a sports deck with a wrap-around jogging track and wellness centre with heated indoor pool. All the public rooms are on Deck 6, and they include: the Astor Lounge, a 485-capacity space where all the main shows take place; the Captain’s Club, which is in the middle of the ship with corridors running either side, one of which (on the starboard side has a smoking area). There is live music here every night, and it makes a nice spot for a pre- or after-dinner drink. Outside here is a four terminal Internet area (the ship also has Wi-fi throughout the ship charged at €7 per hour). There is also a Library and a Games Room and a small boutique selling branded products. Right at the back of the ship you'll find the intimate Hanse Bar, which has a lot more seating on the Sun Terrace; and a poolside bar. On Deck 7 there is a meeting room, which doubles as a fitness class room. The Waldorf Restaurant has an open sitting for breakfast and lunch and two fixed dinner sittings -- at 6:30 p.m. and 8:15 p.m. Tables are mainly for four or more. The food is superb: We had a chicken masala starter, that I yearned could be turned into a main; followed by a creamy potato and leek soup. The Norwegian poached salmon was slightly dry for my palate, but very tasty and the Tiramisu was outstanding. The Club Bistro (Opening times: early breakfast: 6:30 a.m.-7:30 a.m; Breakfast 7:30 a.m.-10:00 a.m.; Lunch 11:30 a.m.-1:30 p.m.; Afternoon tea: 3:30 p.m.-4:30 p.m.; Dinner 5:30 p.m.-8:30 p.m.) is a superb self-service buffet, that looks more like an alternative dining room. It's buffet service, but there are food stations at all times, with egg dishes made to order in the morning and a main whipped up for lunch. Most nights there will be a theme. There are two additional specialty restaurants either side of the Waldorf, both with 22 covers and no charge, you just have to book in advance. The Romantic offers a variety of dishes such as asparagus starters and roast lamb or monkfish for mains; Toscana serves Italian fare such as pasta. Fitness and spa options include one outdoor and one heated, indoor swimming pool, a wellness centre with a salon, two massage studios, sauna, and two whirlpools, and a sports deck. In addition to the jogging track the sports deck has a volleyball court, half tennis court, mini golf range, big board chess and yoga area, a fitness centre and a medical centre. What Marco Polo lacks in size, youth and modern fittings, it more than makes up for in intimacy, style and old-world charm. Having changed hands -- and names -- several times through the years, adults-only Columbus has undergone extensive refurbishments and is Cruise and Maritime Voyages' largest ship. 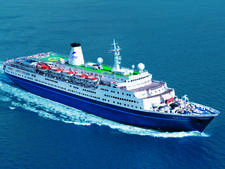 Astoria (nee Azores) is a 550-passenger, adults-only ship originally built as a transatlantic ship named Stockholm in 1948 and later underwent a $150 million restoration. Offering a traditional cruise experience and excellent value for money, Cruise & Maritime Voyages' Magellan remains a popular choice for British cruisers. 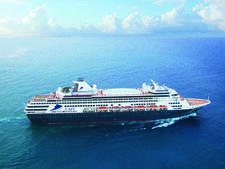 Currently sailing as P&O Australia's Pacific Eden, the 1,220-passenger Vasco da Gama will join the Cruise & Maritime Voyages fleet in April 2019 after a major refurbishment.